Featuring Sam Waterston. Narrated by Keir Dullea. ‘The seeds of The Great Gatsby are in Westport’ claimed a 1996 New Yorker article, and yet it was ignored by the scholarly community and the town of Westport. We set out to find out why. Was the author biased because she’d grown up there? Or did an academic conspiracy deny Westport its rightful place in Fitzgerald’s legacy? We dug into the Princeton Archives where much of Fitzgerald’s papers are kept. We interviewed over a dozen scholars and met with Scott and Zelda’s granddaughter, Bobbie Lanahan. We even tracked down Fitgerald’s publisher, Charles Scribner III. And of course we spent time talking to Barbara Probst Solomon, the esteemed author of that New Yorker article. What we discovered will turn the Fitzgerald community upside down. Please follow us on Twitter. ‘Like’ our Facebook Page too. We’ll be updating our progress as we finalize funding to complete Gatsby in Connecticut: The Untold Story. Thanks for visiting. Robert, Sam & Deej after a day @ the Fitzgerald Westport home. 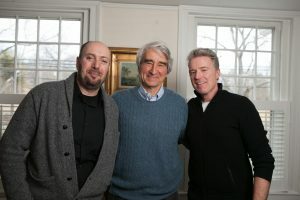 “This film does an excellent job of capturing an important aspect of Westport’s literary history and it helps to establish the town’s rightful place in Fitzgerald’s legacy.